It is difficult for us to imagine the quality of religious beliefs that people had in the 16th Century, so much distracts us in the modern world. Today people speak of their religious preference as if it were on par with their favorite food or sports team. Before the Renaissance and the Reformation, every person, every village, and every activity had a patron saint. There was St. Christopher for travelers, St. Elmo for sailors, St. Germain for sick children, St. Sythe for lost keys, St. Jude for hopeless causes—just to name a few. People found comfort in knowing that their view of life—with faith in the starring role—was shared by nearly everyone they knew. No one questioned God’s existence. Prayers were said several times a day. The Devil and his demons were as real and common to the people of the 16th Century as viruses are to us today, always making promises like a campaigning politician. Catholics called upon the saints and relics for help. 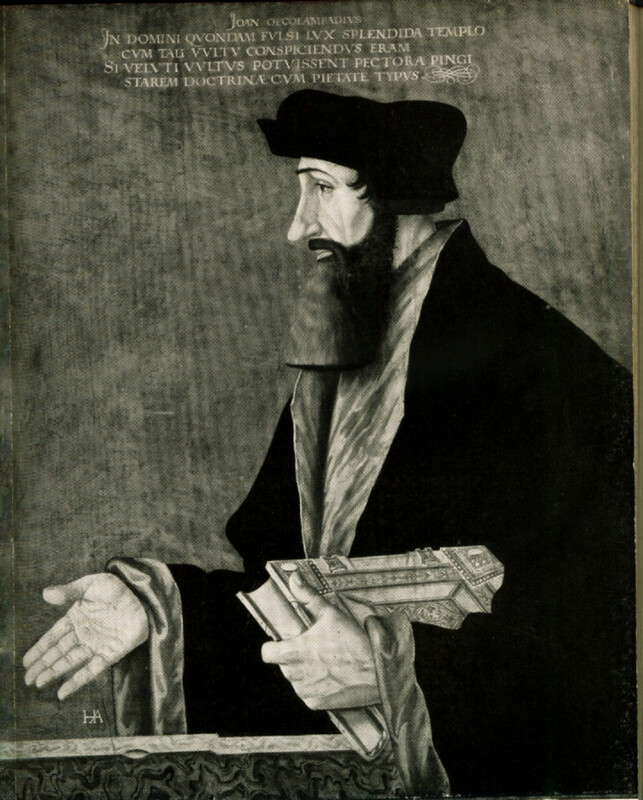 The Protestant Reformation of the Christian Church reached Basel in 1522, through the preacher and theologian, Oecolampadius. 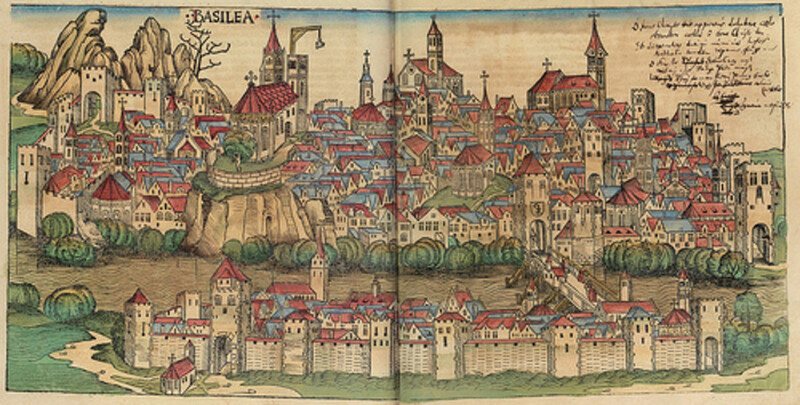 Basel was called the "Athens of Switzerland." It was the wealthiest and most literary city in the country. Basel also served as the nation’s commercial center, as it bordered both France and Germany. Oecolampadius opposed the confessional and preached against the worship of the Virgin Mary. He only taught from the Bible, gave both the bread and the wine during communion, and instituted congregational singing. 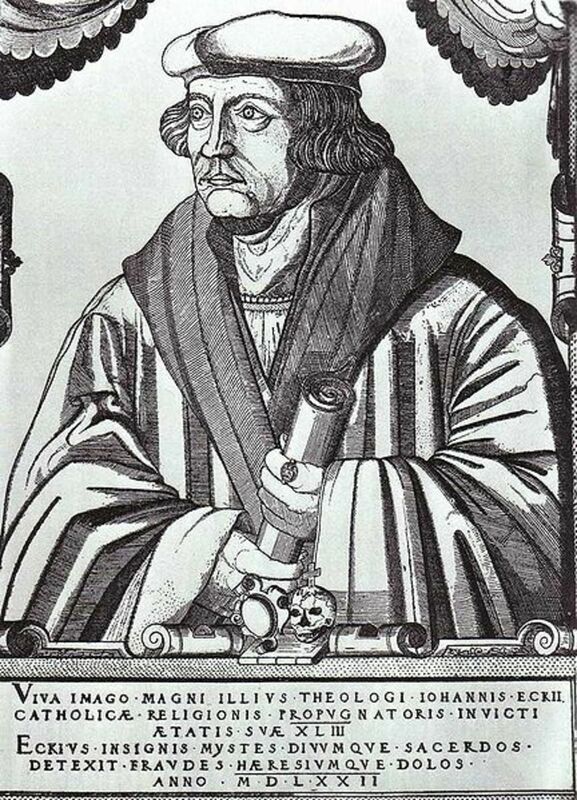 The famous Dr. Johann Eck (1486-1543), the champion of Roman Catholicism, challenged the Reformers to a debate at Baden, Germany in 1526. Dr. Eck arrived in rich garments, glittering with jewels, and while there he ate like a king, enjoying the most costly delicacies and choicest wines. He looked down on the Reformers as little better than a company of beggars. Dr. Eck enjoyed revelry and gaiety, whilst the Reformers were engaged in study of the Bible and prayed to God. Eck haughtily ascended a splendid pulpit while the humble Reformers, in plain clothes, were given only a stool below him. Eck argued for the authority and customs of the Roman Church, and the Reformers adhered steadfastly to the Holy Scriptures. The modest, calm, clear, gentle reasoning of the Reformers won the day. The new Protestant churches did not pull double duty as town meeting halls, banquet halls, and theatres, as had the Catholic churches. They were neither to be a refuge during war, nor a sanctuary for criminals. Protestants had no use for relics, art, incense, crucifixes, confession, or fancy outfits for priests. Their ministers were married men with children, who did not mumble in Latin but preached sermons in a clear, everyday language that everybody could understand—sometimes for hours. Protestants studied the Bible for themselves. The Bible (the word means book) taught history, biography, biology, geography, philosophy, political science, psychology, hygiene, sociology, cosmology, ethics, as well as theology. The Bible presents the panorama of the world and human affairs with such detail that it is hard to think of a human situation without biblical example. Men were granted free license by the Roman Church during these times, as long as they contributed to the Church treasury. Thus, men were given the choice of the forgiveness of sins for money, or the forgiveness of sins through Christ. Rome had made sin a source of revenue. A Catholic monk named Samson traveled around Switzerland extracting money from poor peasants and the wealthy for Indulgences. But when he reached Zurich, Switzerland, he found he could not sell a single pardon, and left there empty-handed. 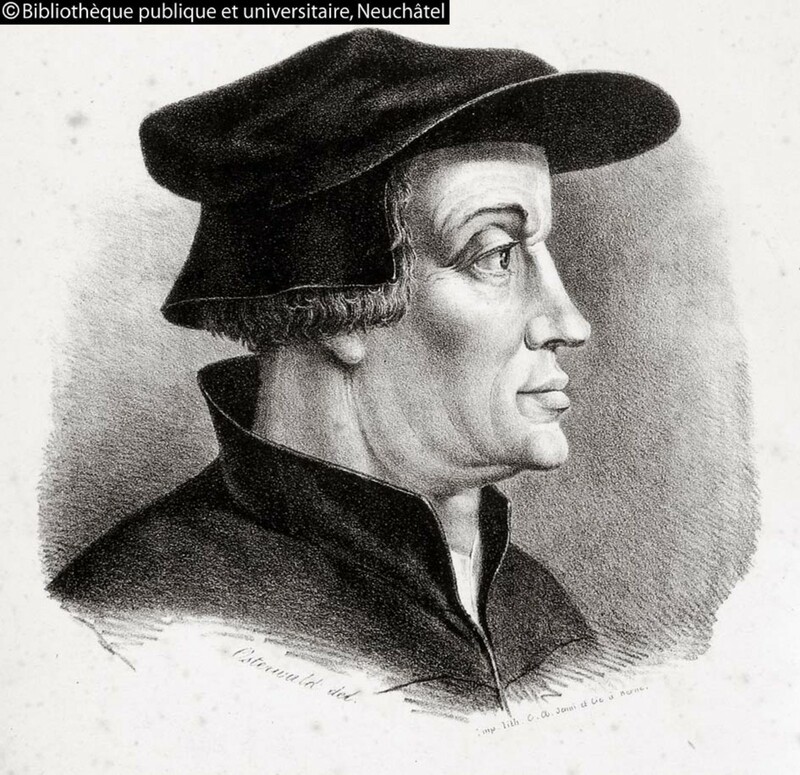 Ulrich Zwingli (1484-1531), of Zurich, challenged the doctrines and ecclesiastical organization of the Roman Catholic Church in 1522. He rejected the authority of bishops, and declared that local communities had the right to control their own religious affairs. He claimed that the Eucharist was a simple, symbolic ceremony—and rejected Transubstantiation. "Do not imagine that God is in this temple more than in any other part of creation. Whatever be the country in which you dwell, God is around you, and hears you. Can unprofitable works, pilgrimages, offerings, images, the invocation of the saints or of the Virgin, secure for you the grace of God? God looks at the heart." To many of his listeners these teachings were bitterly disappointing, since it meant that their previous efforts had been in vain. Zwingli went on to say, "The life of Christ has been too long hidden from the people." He opened the Gospels to people in great numbers, inspiring them with the narrative of the life, teachings, and death of Christ. "It is to Christ that I desire to lead you." People from all classes listened to his words with deep interest. Zwingli wrote, "The law in its essence is the character, will, and nature of God. The Law is a Gospel for the man who honors God." Zwingli taught that people come to Christ as individuals, not needing the mediation of any church. He began preaching his own sermons, rather than the official lectionary of Rome. Crowds flocked to hear him in huge numbers; so many that he began to give Friday sermons in the city market, which held far more people. He preached true repentance and godly living; caring for the poor, for the widow, and for the orphan. He denigrated indulgences and what he called the superstitions of the Roman Church. He then went on to persuade the city council to strip the churches of their images, ornamentation, and organs. Services became short and simple, without hymns. There were no more priests in robes with their backs to the congregation, but instead a minister in everyday clothes who stood in the midst of the people and served the bread and wine. Monasteries were converted into centers for housing, feeding, and teaching the poor. Zwingli was killed during a battle against Catholics in 1531. His body was then burnt and mixed with manure. 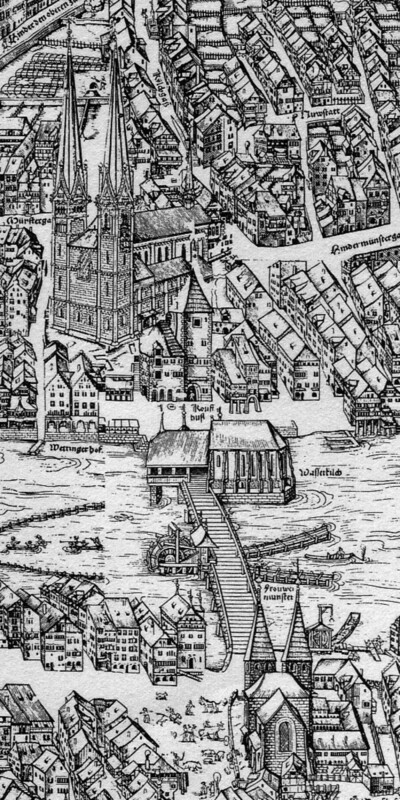 The battle was sparked by a Zurich printer who dared to eat meat on Lent. He told Catholic authorities that his preacher, Zwingli, had taught that the Bible places no restrictions on food. Zwingli preached, "God does not desire our decrees or doctrines if they do not originate with him." The people of Zurich, well known for their independent streak and fine army, agreed, and wrested control of the city from the Catholic bishop. It seems that God passes by the titled and wealthy of the earth; those who are accustomed to receiving praise and showing pride in their superiority. They perhaps cannot be molded to sympathize with their fellow man enough to cooperate with Jesus of Nazareth. It was the unlearned fishermen who were humble and therefore teachable. The Reformers used as God's instruments were men of humble origins; they were free from pride of rank. Zwingli was born in a herdsman's cottage, and he was reared amid scenes of natural grandeur, beauty, and the majesty of God in the Alps. His pious grandmother read Bible stories to him as a child. He was a gifted speaker, writer, poet, and musician. He pronounced, "The Scriptures come from God, not man, and even that God who enlightens will give thee to understand that the speech comes from God. The Word of God cannot fail; it is bright; it teaches itself; it discloses itself; it illumines the soul; comforts it; humbles it; so that it embraces God." William Tyndale (1494-1536) was educated at Oxford and Cambridge. 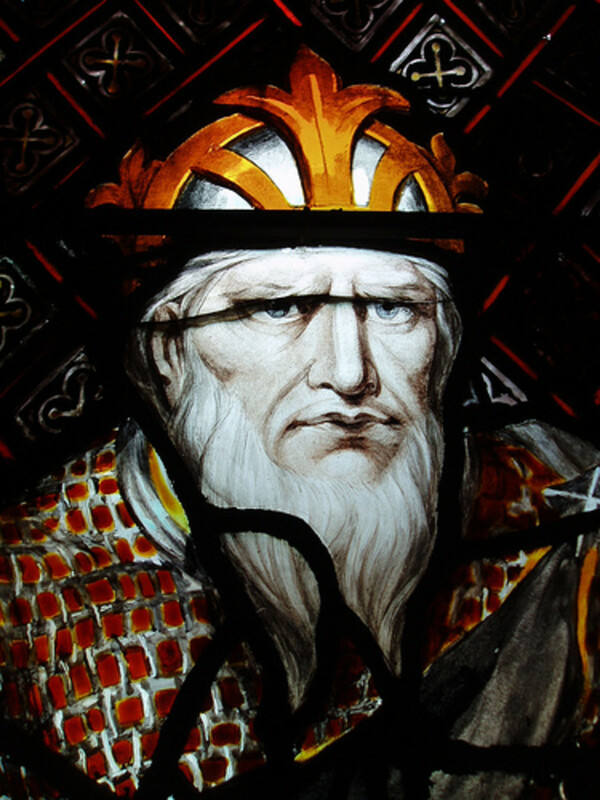 He had command of eight languages— most notable among them Greek and Hebrew—a virtually unheard of ability at the time. 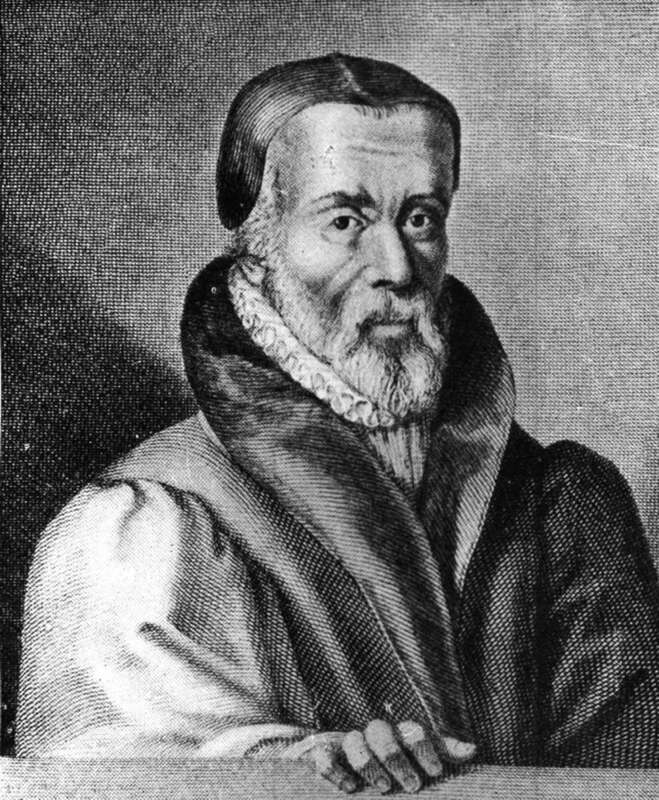 After being ordained as a Catholic priest, William Tyndale requested the church's permission to translate the Bible into English; his request was denied by the Bishop of London. This denial gave Tyndale a new awareness; he came to see that the Roman Catholic Church was able to successfully maintain its control over the faithful by keeping the Bible in Latin, which only its representatives could read. He came to the understanding that the ability of laymen to read the Bible in their own language deeply threatened the Church. Tyndale said that Christ would not want His Church to prevail by fear. He then left England and joined the Reformation. John Wycliffe had already translated the Bible from Latin to English, but it had never been printed. The cost of hand written copies was so great that only nobles or wealthy merchants possessed it. Tyndale determined to translate the Bible from Erasmus' Greek translation and have it printed so the common Englishman could read it in his own tongue. 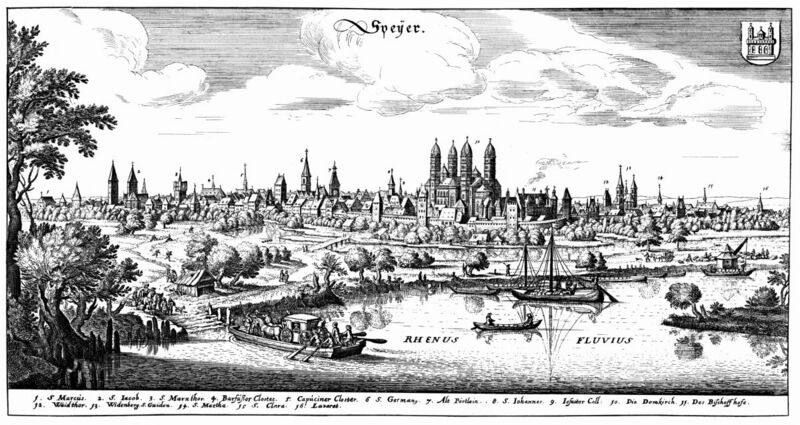 Tyndale settled in Antwerp, where he was hidden by sympathetic English merchants. There he translated the Greek New Testament into English, and had 3,000 copies of it printed in Germany in 1526. 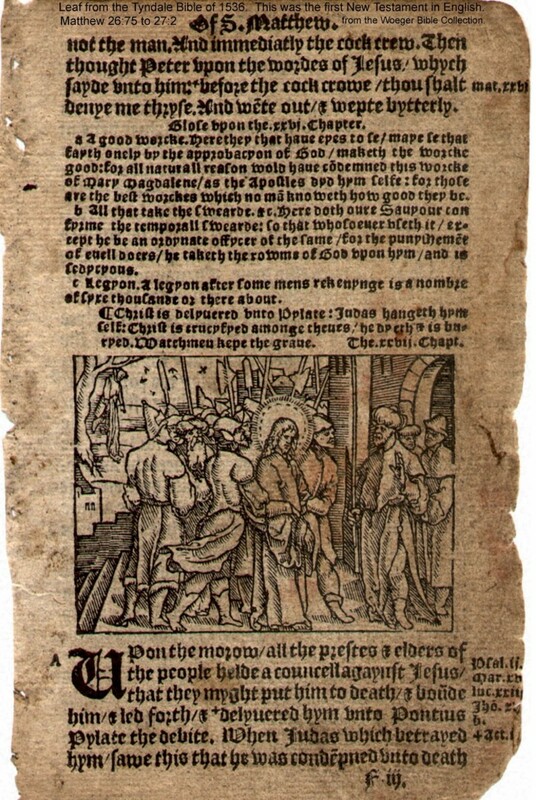 The Bibles were then smuggled into England, which outraged Cardinal Wolsey, who issued an arrest warrant for Tyndale. (Tyndale had also infuriated King Henry by criticizing his divorce.) In 1535, he was finally betrayed, apprehended, and burnt at the stake. The purpose of burning heretics was to reduce them to ashes, leaving no trace of them on earth. The Tyndale Bible left a lasting legacy. It is so well done that 90 percent of his wordings were used one hundred years later in the King James Version—and 75 percent of the wordings used in 1952 when the Revised Standard Version was published, despite the evolutions of the English language. Many of Tyndale's phrasings survive to this day, such as "Salt of the Earth" "Signs of the Times" "The powers that be" "Scapegoat" "Broken-hearted" "Am I my brother's keeper?" "Fight the good fight" and "Eat, drink, and be merry." Holy Roman Emperor Charles V called a Diet (solemn meeting) in 1529, at which he declared that all of Germany must return to the Catholic fold. Six of the princes protested, and it is from this Protestation that the Protestants were named. The Confession of Augsburg was composed by Philip Melanchthon in 1530. This is the Protestant Manifesto. It was meant to be conciliatory, and so it purposefully ignored divisive issues such as purgatory and the papacy. The idea was still to reform the Catholic Church—not split from it. Charles V was determined to crush the Protestant movement. 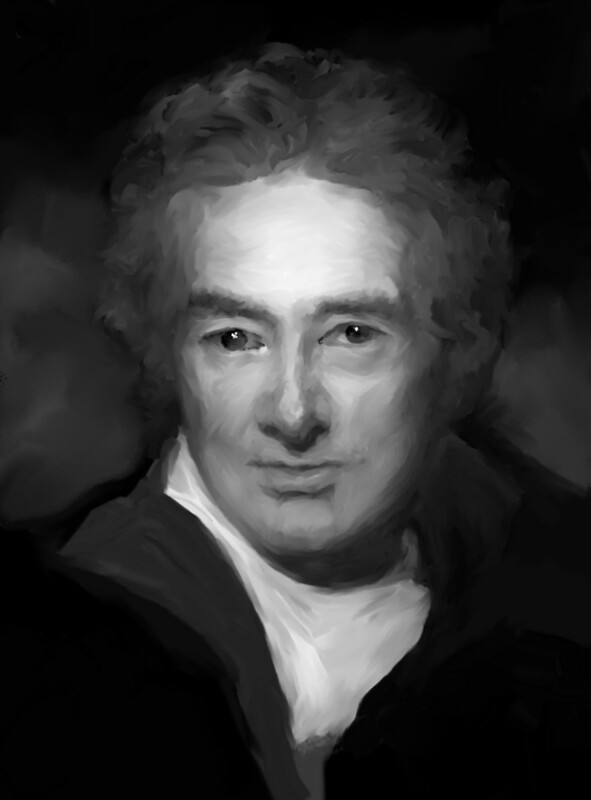 He was afraid that liberty of conscience would lead to civil disorder. 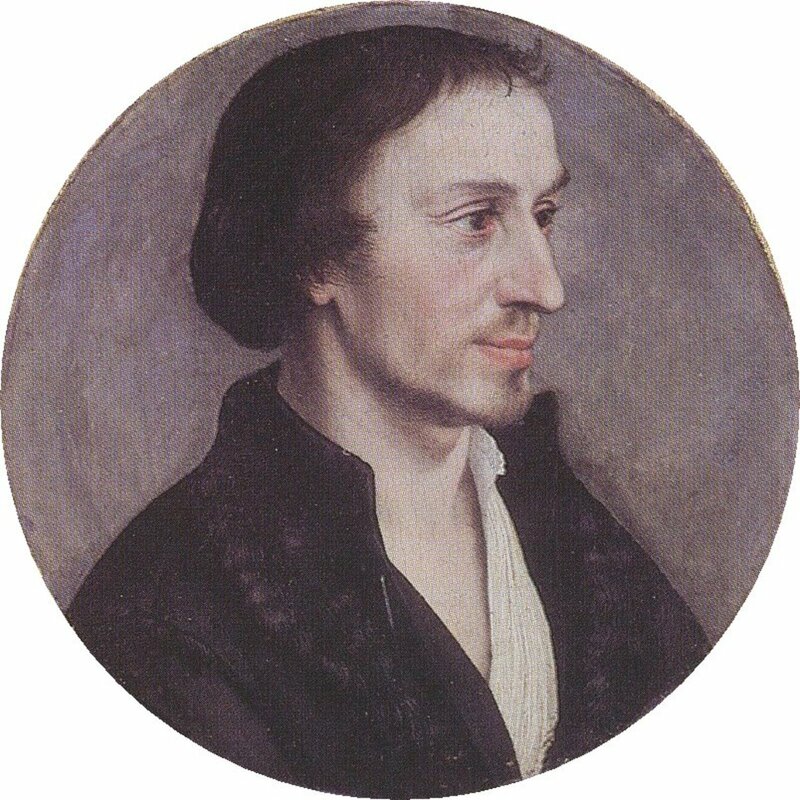 Charles issued a decree that forbade any new reforms, outlawed the teachings of Martin Luther, and prohibited conversion to Lutheranism. He demanded submission. 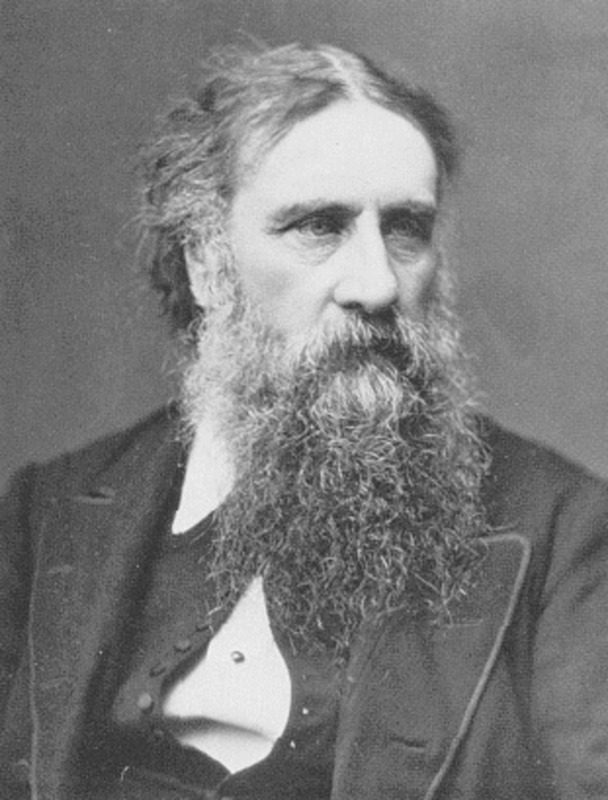 "We protest by these present, before God, our only Creator, Preserver, Redeemer, and Savior, and who will one day be our Judge, as well as before all men and all creatures, that we, for us and for our people, neither consent nor adhere in any manner whatsoever to the proposed decree, in anything that is contrary to God, to His Holy Word, to our right conscience, to the salvation of our souls. "There is no sure doctrine but such as is conformable to the Word of God. The Holy Book is, in all things necessary for the Christian, easy of understanding, and calculated to scatter the darkness. We are resolved, with the grace of God, to maintain the pure and exclusive preaching of His only Word, such as is contained in the biblical books of the Old and New Testaments, without adding anything thereto that may be contrary to it. "This Word is the only Truth; it is the sure rule of all doctrine and of all life, and can never fail or deceive us. He who builds on this foundation shall stand against the powers of Hell, while all human vanities that are set up against it shall fall before the face of God. For this reason we reject the yoke that is imposed on us. "At the same time we are in expectation that his imperial majesty will behave toward us like a Christian prince who loves God above all things; and we declare ourselves ready to pay unto him, all the affection and obedience that are our just and legitimate duty." People were amazed at the boldness of the protestors. Bloodshed seemed inevitable. Protestants had set the Word of God above the visible Church. They were determined to obey God above man; the crown of Jesus above that of Charles V. Human teachings were subordinated to the teachings of God. All evangelicals adopted this protest as the expression of their faith. Satan went to work to oppose God's Word, as he always does. That same year, a death sentence was decreed in Antwerp for anyone not an official Catholic theologian who discussed any article of faith. Antwerp was one of the busiest, richest, and most cosmopolitan cities in Europe because its port had made it the center for international trade and finance for Europe. 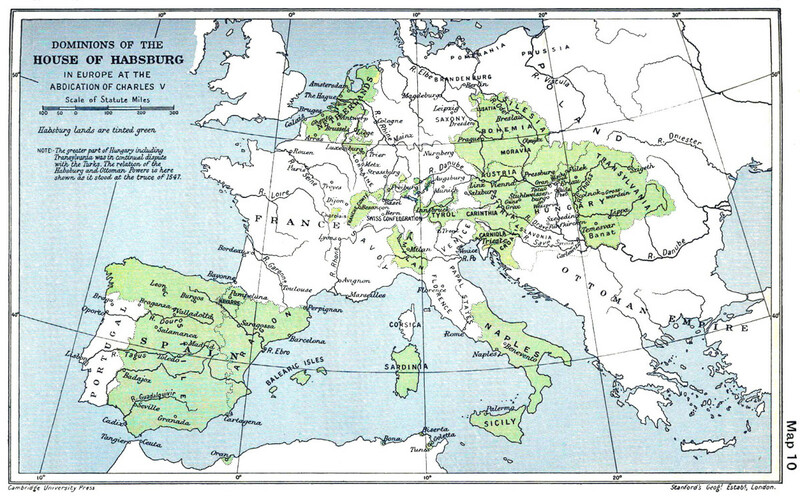 The region around Antwerp was known as Flanders, and that region provided half of the Holy Roman Empire’s income. 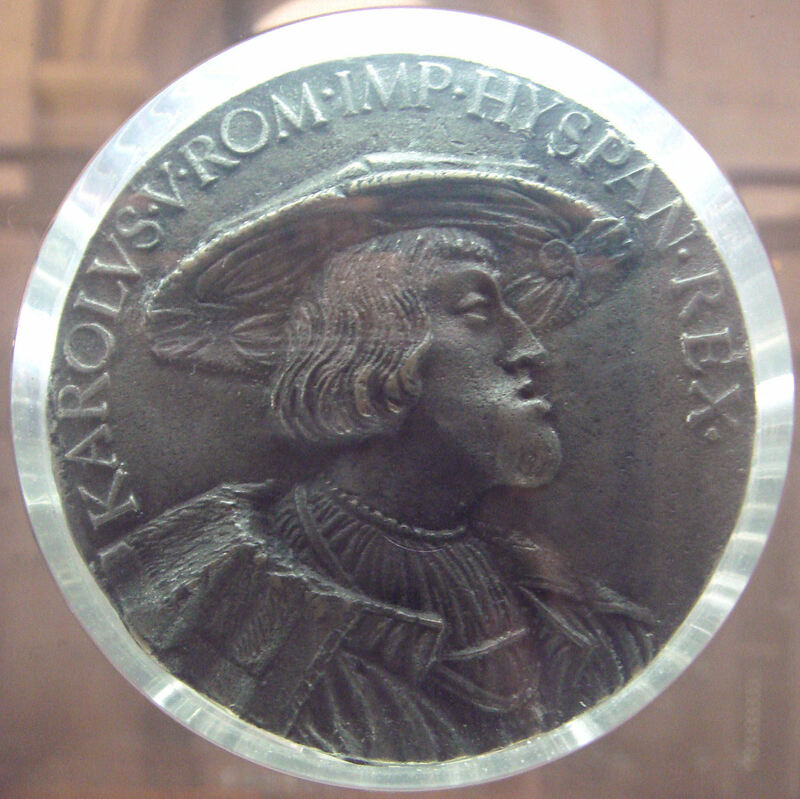 The emperor, Charles V, was himself a native of Flanders. Luther's books had been brought there in the 1520’s, and then translated into Dutch. During the 16th Century, six hundred Protestant churches were burned down and thousands of Protestants became martyrs. This persecution was successful, as today only 30% of the Christians in Belgium are Protestants. 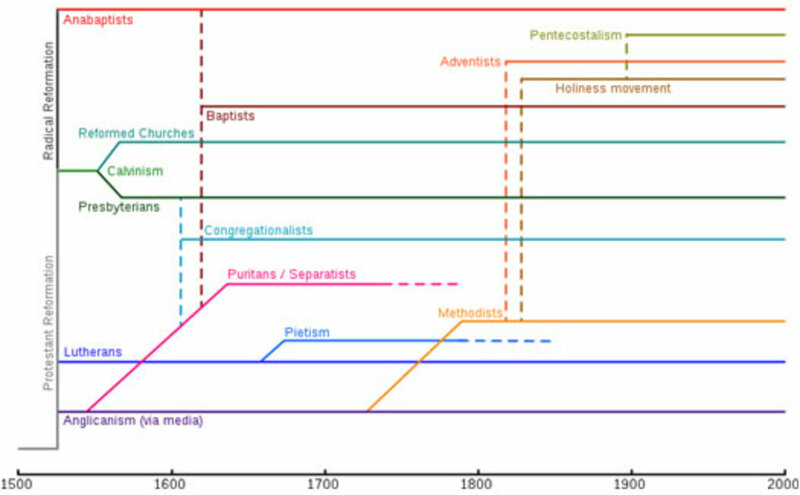 In 1530, Christianity split into three main branches: Orthodox, Catholic, and Protestant. This split is the cause of the demise of the word Christendom—replaced by the word Europe. Protestantism made a major impact in Europe with regard to rising literacy, education; and the establishment of free enterprise and capitalism. Protestants stressed literature and education while Catholics stressed art and architecture. The problem for Protestants was that since only the Bible had the final say over their beliefs, they began to split apart as differences in opinion arose as to what the Bible said. Thus the Protestant movement fragmented, first into two camps: the Lutherans of Germany and the Reformed of Switzerland. Today, there are over 300 recognized denominations. The first two divisions of Protestantism agreed that the Bible was their sole authority, as the inspired Word of God. But the Reformed felt that Luther had not moved far enough away from Catholicism. The word Eucharist means thanksgiving. While Catholics maintain that the bread and wine used in Eucharist are transformed into real blood and the body of Christ, to the Reformed Protestant the bread and wine are merely symbolic, used to memorialize the Last Supper and give thanks for the forgiveness of sins. John Calvin said that Christ was always everywhere, including at the Eucharist. The Swiss Reformers admired Martin Luther and felt themselves to be in common cause with him, but they nonetheless felt Luther had been far too friendly to the ideas of Papists, what with his hopes of reforming them. 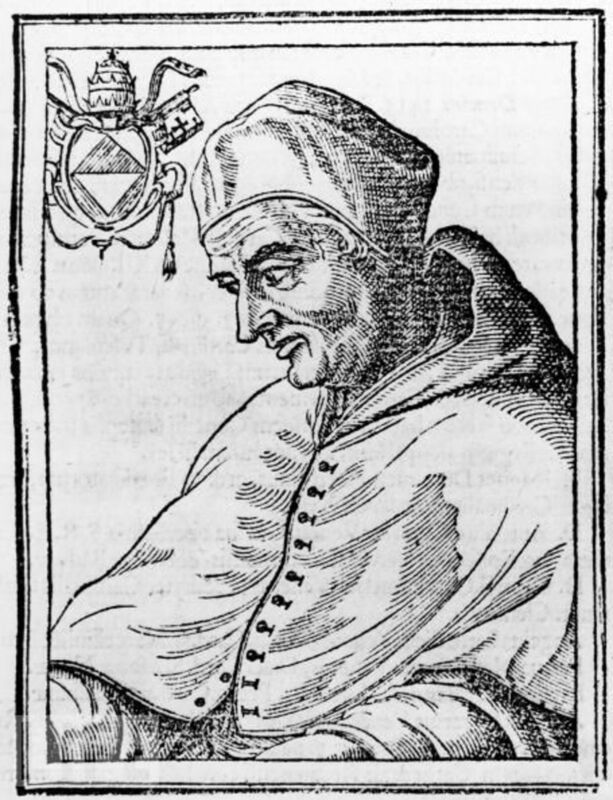 The Reformers thought transubstantiation to be a fantastic invention of Pope Innocent III. Jesus was only present in communion spiritually, not physically. Martin Luther defied the authority of the popes, all of whom could and did err. But Luther kept the doctrines of infant baptism and transubstantiation, which later Reformers rejected. It can be said that Renaissance Christian Humanism produced the Reformation; the most influential catalyst being the Greek Bible of Erasmus. The Catholic Church was concerned that Erasmus had "corrected" the Latin translation by the use of the Greek. The Protestants exalted the Word, will, and commandments of God over all human words, including those of the Catholic Church with its traditions. My sources used to prepare this article include: Reformation of Church and Dogma by Jaroslav Pelikan; The Great Controversy by Ellen G. White; The One Year Book of Christian History by E. Michael & Sharon Rusten; and A Short History of Christianity by Stephen Tomkins. Polly— Hey! I am glad you came over to read this Hub. I was not familiar with Zola Levit until now. I went to Israel with a Messianic Jew named Rabbi Bob Gorelik. Check him out; an interesting and wonderful man. Your comments really hit home with me. I hear what you are saying and I agree with you. God Bless! Well James I won't bat my eyes at you (lol) but I agree we should get the word in our heart where it can never be stolen, I see bad ahead and the bible told me so...how who what, well there are some really good guesses but really we just need to know God's word and cling to it with all the faith our studies have helped us acheive. We also are told in this time to help the Jew, God's chosen to make it home, He is waiting on them. It won't be as they think but it is where they need to be with the earthly promise. Did you ever listen to Zola Levit, Jew turned Christain? He is dead now but can you imagine if you did not hear him what a blessing He was understanding all so much better. I have got to get some of his books, maybe check online too, God bless. "To the Jewish mind, an 'unlearned disciple' is an oxymoron." Yes! You know, that must be so. "As for 'organised religion'? Jesus did not have a problem with it, only with the way it was organised - the Church is an 'organism' (a living family) not merely an administrative 'organisation'." Amen! This thought alone is a great blessing to understand. "What most people don't realise today is that Jesus was a Rabbi and recognised as a Rabbi by the way he dressed." Wow! I had never thought of this. It makes perfect sense. This and the rest of your words are illuminiating. Another triumph. I'm all out of superlatives. One thing I disagree with many of the Reformers over is the notion that Jesus' first followers were uneducated. They were not. They were disciples and would have already had a basic level of Scriptural knowledge that we would consider 'learned' by today's standards. To the Jewish mind, an 'unlearned disciple' is an oxymoron. There is an implicit notion that a disciple is taught by a rabbi and learns what he or she is taught. As for 'organised religion'? Jesus did not have a problem with it, only with the way it was organised - the Church is an 'organism' (a living family) not merely an administrative 'organisation'. 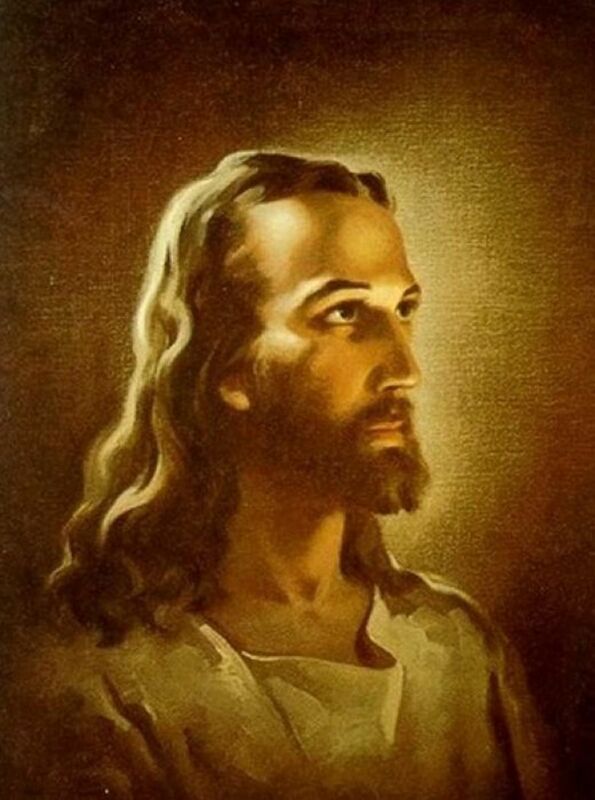 What most people don't realise today is that Jesus was a Rabbi and recognised as a Rabbi by the way he dressed. There were no newspapers or TV News in First Century Judea, so people only knew what Jesus looked like by meeting him, yet time and again they addressed him as 'Rabbi'. Have you ever wondered how Jesus went to the feast 'as in secret'? Simple: He went in plainclothes as it were and not dressed as a Rabbi. See it now? - Their incredulity was because they did not recognise him as a Rabbi because he wasn't dressed as one. 50 Caliber— Thank you for helping me in this way, and for the explanation. I'm going to check it out, brother. Good man! James, Stumble is an add on program and I don't know if there is anything to compare it to. As you read or visit sights you rate them thumbs up or down. If your the first rat you get to attach links and do a short recommendation. After a bit it learns what you like and don't. So if you ever find yourself board, you can hit the stumble button and it will take you around based on your likes and dislikes. You can add friends and instead of those pesky e-mails, they just get a number of how many recommendations they have, and you can look at them at your leisure. It's just another way to add exposure. I put it on to help those I know are trying to make some money. Hxprof— Thank you, kind sir, for your warm salutations. I appreciate your words more than you could know. Freya Cesare— You're welcome, my dear. Thank you for your nice compliments. 50 Caliber— I'm glad you enjoyed and appreciated my work. That Olde English typeface is hard to read, and some letters have changed drastically as well. I am surely grateful for the thumbs up and the Stumble. I've heard of Stumble though I must confess I have no idea what that means. Thank you for the affirmation. James, I'll call you Professor Watkins if you don't mind; God's church being the 'spawn of Satan' may be a bit extreme, though yes, the churches have grown liberal. That's a side effect of them avoiding the work of the cross, of traveling on the 'broad highway' rather than the narrow road which Christ lays out for us. Unless we allow Him to crucify all in our (Christians) hearts that is opposed to Him (strong holds, speculations, etc. as mentioned by Paul) then we won't be able to stand in the coming days. This is the problem faced by ALL churches. Those few who so far are moving back to teaching EVERYTHING Christ taught are but a vanguard of things to come. Millions more Christians will come back to sound doctrine as the heat gets turned up preceeding the Great Tribulation. God loves His people, all of us, but He will have His church as a pure bride. See Matt.chapter 25, the book of James and both books of Peter. GPAGE! Brilliant!? Wow! I am basking in your afterglow. I so appreciate your encouragement and affirmation. I love you! Tom Whitworth— You've got your trust in the right place, brother. Thank you so much for your ongoing encouragement. It means a lot to me. Hxprof— Thank you, brother. Yes, I agree that the denial of Scripture to the common man was a travesty. You are surely right that the "main line" Protestant denominations—most of whom now approve of abortion and homosexuality—are the spawns of Satan. I know exactly what you are saying, my friend. You are right about what is to come. God help us. lefseriver— :D Thank you for the compliment. I appreciate it. Another great installment in your history of Christianity. I find it amazing that with all the squabbling among one another that The Word has suvived to modern times. I have never believed in a dogmatic view. I just trust My Lord and Savior!!!!!!!!!!! James, this was another well-constructed piece. Your delving into the period of the split between the Roman Catholic Church and the reformers reveals many of the lies being taught then-lies that the common man couldn't understand were lies because the so-called 'Church' denied him access to the scripture. The blood of many is on the hands of those who ran the 'Church' back then. Fast forward to our times. James, if you take some time to look into how the teachings of the protestant church have changed in the last 50 years, you'll find, as I did, that damnable lies are being taught in most churches. What is so insiduous about the lies is that they have SOME truth to them. Since most of us are just reading our Bibles, or studying our Bibles to confirm the views of a particular denomination, we miss the lies. I will add only this: We are soon to hear preaching/teaching that contradicts in key details the Gospel as it has been taught in the churches for the last 50+ years. The basics are true-most churches get the basics right-but they deliberately leave out the harder teachings because as is prophesied in scripture: 2 Timothy 4:3 "For the time will come when they will not endure sound doctrine; but having itching ears, will heap to themselves teachers after their own lusts". Christ says in Matt. 24: vs 4-5 "See to it that no one misleads you, For many will come IN MY NAME,(caps mine)saying I am the Christ, and will mislead many". The words 'in My name' are key. Most of us think this means many will be misled by people claiming to be Christ Himself, but that's not the case mostly. Rather, they come in His name saying, "I know the way; I have the character of Christ formed in me and will teach you HOW to grow up in Him." I enjoy your writing, but will no longer be able to comment on any articles related to Christ/Christianity; I prefer to keep my mouth shut on this, and will do so going forward. Keep up the excellent work James. If Hub Pages ever has a 'seminary' this might be a site to start out. JannyC— Thank you! Thank you very much. itakins— Thank you so much for the accolades. I know you don't worship the Virgin Mary. I got that comment from two biographies of Oecolampadius. Apparently somebody was doing so during his time on this Earth. I greatly appreciate this visit and your excellent remarks. skye2day— Thank you so much, my friend and sister, for your lovely and gracious words. I am humbly grateful that you appreciated my article. I will come and read your Hub "To Love Larger" soon. I love you. God Bless You. And yes, Jesus has always had my back—and my heart. Wow! What an informative and well-written hub! I learned so many things here, things that I usually just gloss over or don't pay much attention to. I wish History books are written this way. Educational and entertaining. Love the Renaissance era too so enjoyed this very much. Brilliant-up there with your very best.I'm impressed by the balance you show in your responses. I'm also impressed by ST L's comment-in fact ,I believe many of the problems we are currently having in the Church in Ireland are due to the 'hand in glove' relationship between church and state over many years-when one did wrong ,the other covered its back. We are now dealing,rather painfully,with this legacy. To repeat myself-Catholics do not worship Mary-or indeed never have done so.We worship God-and God alone. Again excellent hub Prof Watkins. Hello James, Bravo. You do love your history. Wish you had been on a couple of my debate teams in 'Contemporary Civilization' in High School. lol. James the workers are few but the Harvest is plenty. You did an awesome job in portraying Gods vision in this era. It is the same today, because God never changes. He is the same yesterday, today and tomorrow. I enjoyed the History Lesson. I wish you could teach Christianity 101 History in all of our school system's. Hey, we could clone lots of little James W. to share the truth. ( - : Kidding. There is only one James. We have much work to do for our Lord. When you get to hubbing around read my 'To love Larger' that is my 'history' hub. Many Blessings James. I love ya, I know Christ smiles on you bro. Your friend and sister in Christ. Saintatlarge— Thank you for the laudations and blessings, St.L. I hope everyone reads your extraordinary commentary above. I can offer no rejoinder except to say to you: Amen! Jean Kotzur— It is nice to see you again, Jean. Thank you for taking the time to come by and read my article. I sincerely appreciate your warm regards. I do love history. Hello, hello,— Thank you so much for your affirmation and encouragement. And you are truly welcome. Wealthmadehealthy— Thank you very much for your gracious comments. I am pleased that you enjoyed it and I appreciate your blessings. I also agree with you. katiem2— You are welcome. I am so glad you enjoyed this piece. Thank you for coming! James great job as per usual. I'm extremely overjoyed that just as Jesus disciples were sent with the message and had vision, inspiration, passion, and love; and then Paul who carried an even greater passion for the gentiles. These forerunners have made the way for us seem easy and without many bumps. Those of this time period it is interesting to note that it usually started with one individual who wanted what God wanted. Even though it might mean death, which many succumbed to. There is really nothing new under God's sun as we fight the same battles over and over. We all know that the passion for the fullness of God wanes in our present society. 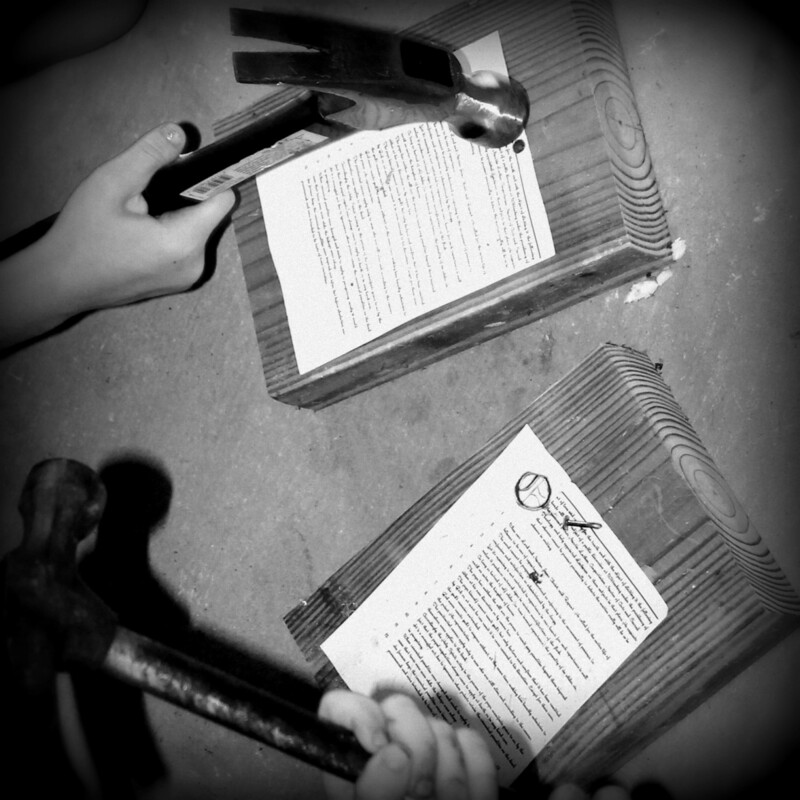 We hammer the government for their disdain of Christian morality, but the government was never to be the source of spiritual guidance, because the government of our society was built on principles for the people, but if the people will refuse to have a passion for the things of God and not take their stand as did these reformers then we will have what we get and we will be the ones to blame for it. It is never the majority that brings healing and change but those individuals who catch a vision or see what no one else sees. We have much to learn from these passionate voices. Well done brother, blessings St.L. OpinionDuck— I wish we didn't have 300 denominations. I believe one day they will all come back together. I have visited countless churches of many, many denominations, and I do not find much difference in them. I've never been to a church where the people were not warm and welcoming, the service reverent, and the worship genuine—be it Catholic, Pentecostal, Baptist, Episcopalian, Methodist, Presbyterian, Evangelical. They all agree on the basic tenets of the faith; they differ on fine points. They differ in style, not substance. This in no way invalidates Christianity, as is evidenced by a quick look around the world. I am always amazed at the depth of research/knowledge of your hubs. The accuracy is amazing. I am British and the historical content of your hubs was standard school history for us. It is all part of our European heritage. I agree with you that the history that has led up to modern day Europe is fascinating. Many people were killed and tortured in the name of religion, but we all know that it had nothing to do with our maker, but served the prestige and power of crowned heads of state and religious despots. After a comprehensive research you have written a great hub. Thank you very much for the pleasure of reading it. Hi James! You opened this historical lesson with It is difficult for us to imagine....Which is true...But I believe that you have helped us understand much better thanks to your sound writing and historical facts! Thank you for that. And thanks for all the work you put into these hubs! singlmomat52— You are welcome. Thank you so much for your gracious comments. thevoice— You are welcome. I must say I am well pleased to read such a string of laudatory adjectives! Thank you! Captain Jimmy— Thank you. I have not read either of the readings you mentioned. Sure, if you can provide the links I'll be glad to take a look. I appreciate you for reading my work. James this was a wonderful hub. As to the persecution of the churches away from the RCC they will be soon at it again. History my friend always repeats itself. I follow Jesus, not a church organization. This is the Way. And to die for my belief in Him would be nothing more than heaven to me. I will not deny Him...but there are many churches leading in the wrong manner today. Many false prophets. I sincerely enjoyed reading this....many blessings to you and your family!! As I tend to repeat ad nauseum, I wish I had had your compact, clear snapshots of history, personality and pivotal events in my course of studies. Not to be overly laudatory, but there's something about your writing style that combines fact, tangential opinion and a dash of humor to make everything easy on the eye and brain ... all without patronizing your readers. Well, as the Hat said to the Coat Rack, "You wait here, I'm going on a head." See you there! You are cheating, I said democrat and republican, not liberal and conservative. But, I do agree with your comment on the social liberal. As for the three hundred denominations, the fact that there are that many is the problem for me. There just isn't enough clarity in the bible(s) to support formal religions. Your Hubs are always very informative and terrific reads. Thanks! sheila b.— Many, many people through the ages have been willing to die for their beliefs. And many have. Thanks for your comments. Trish_M— You're welcome! Thank you very much for visiting and commenting. I'll look forward to those links. Please add them. advisor4qb— Thank you, my dear. I always enjoy your comments. I'm glad you came. "I feel certain that the next stage in the history of religion will be the burning of Bibles...and then it will be important that the Word is in our mouth and in our hearts"
dreamreachout— Thank you! I appreciate your excellent comments. Welcome to HubPages! Vladimir! Hello my friend. Thank you for your gracious words and you are welcome. "While democrat and republican are technically bound by the same "book", they interpret it differently"
I don't agree. The most progressive thinkers—those who set the agenda followed by Social Liberals—do not believe in the "book" (Constitution) at all. They want it done away with. But they know that to say so publicly at this time would bring charges of treason, so they undermine it covertly instead. They do not believe in it. The disputes about the Bible, while argued vehemently, are really about minutiae, not the ultimate meaning. 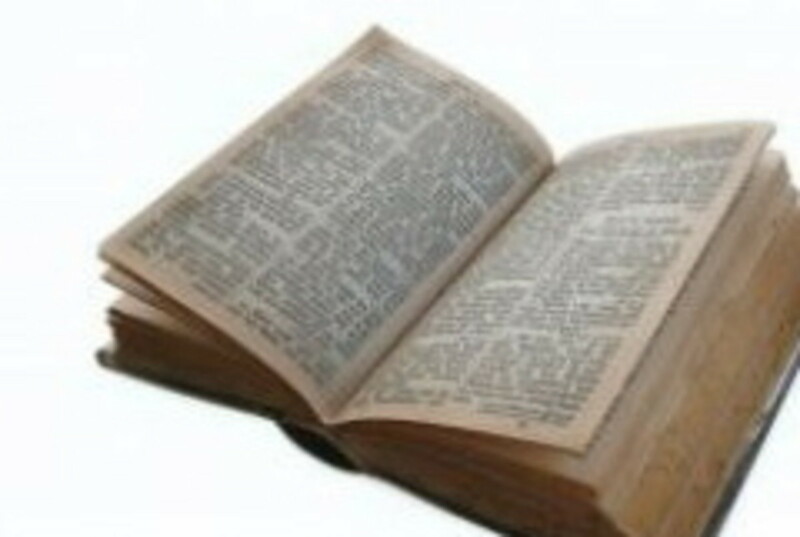 Virtually all 300 denominations agree as to what the Bible means, in its important parts. Another very good hub, Much of this history the modern world would like to bury or rewrite to there agenda. I'm glad to see someone digging for the facts! Have you read "The Trail of Blood" by J.M. Carroll or "The London Baptist Confession of Faith, 1677/89"? If not let me know and I will send you a copy of each. Keep Digging! Dear James : Your fantastic work is educational as always, and pictures are remarkeable. God Bless you dear friend. You bring this history to life. I always end up wondering if dying for one's beliefs was the right course. Very clear and informative. I find this a very interesting subject. Thanks! I'm with ecoggins, who couldn't have said it better. Yet another interesting and informative hub, James! That was very informative...it is a compelling argument for the Word...where the Word is there is light. I often thought that the fact that the Bible is still in existence is proof of a living God who speaks to people...I feel certain that the next stage in the history of religion will be the burning of Bibles...and then it will be important that the Word is in our mouth and in our hearts. Marvellous hub!! Unfortunately in rural India its still the same way and that is irrespective of the religion you are following!! Its further abated by the politicians, which they do to make vote banks to further their own cause!! James I do love your fine work. Thank you much. James another well done overview of history. Out of all the people mentioned in this hub, I like Zwingli the best. My own opinion is that formal religion has all of the shortcomings of man that is found in politics. Just as politicians use and abuse the Constitution and the people, so does formal religion. Both the politicians and relgious leaders use the "Book" to compel the people to their will. In US Politics the big division of power is not the "booK" or the branches of government, but it is the political party. While democrat and republican are technically bound by the same "book", they interpret it differently. Their interpretation leans toward the party and not the people. The same is true for religions based on the "book", the bible in this case. The running of these religions is similar to the political or governmental organizations. Neither the Democrats, Republicans nor the Catholics or the Protestants were around during the events that resulted in their "book". So while they all have a feeling about the contents of their "book", they don't really have a feel about why it was created. Sure, they say they do, but do they really apply it properly? ecoggins— I humbly accept your laudatory remarks, Brother. Thank you very much for lifting my spirits. prasetio30— I love history, my friend. Thank you for visiting my Hub and complimenting my work. I'm glad you liked it. I always learn so much when I read you hubs. They are works of art in narrative form, literally masterpieces. This one is no exception. James, I like something about history. And I found it here. This hub is great hub. You give us wonderful knowledge here. Good work my friend. RevLady— Thank you for being my first visitor. Yes, as you say, history does repeat itself. I am not exactly clear what you mean about oppression by the church today. I think a big oppression OF the church is right around the corner, and that the church is being suppressed now by secular forces in America. I appreciate your compliment. God Bless! Seems like Zwingli and others had to confront many of the same issues we are tackling today. Oppression by the church is alive and well in the 21st century. Does history not repeat itself after all? Is it not virtually the same battle, different soldiers. Every century has its heroes in every category of life, who are usually persecuted and whose contributions not fully appreciated until after their death.